WHAT'S INSIDE 4 Breathe Easy… With the Right Laser Fume Extraction System Why do you need a proper fume extraction system? Chau Vo, PAT Tehcnology Systems, explains. 12 Glassware Engraving Techniques for Laser Operators Amy Dallman of Epilog Laser offers tips to acheive flawless glass engraving as well as a step-by-step how-to. 16 Product Showcase: Laser Engraving Equipment and Supplies This product section has everything you need to complete and expand your laser business. 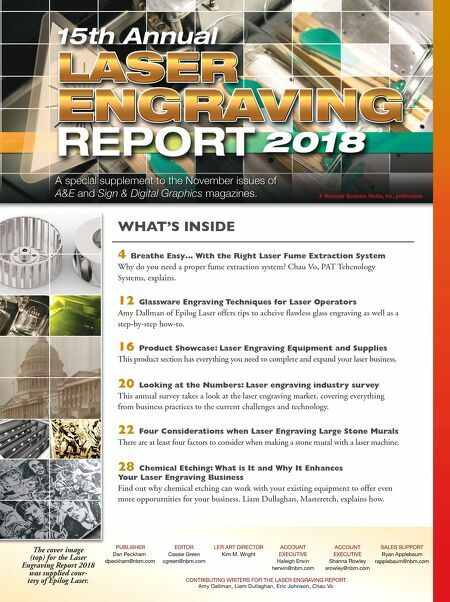 20 Looking at the Numbers: Laser engraving industry survey This annual survey takes a look at the laser engraving market, covering everything from business practices to the current challenges and technology. 22 Four Considerations when Laser Engraving Large Stone Murals There are at least four factors to consider when making a stone mural with a laser machine. 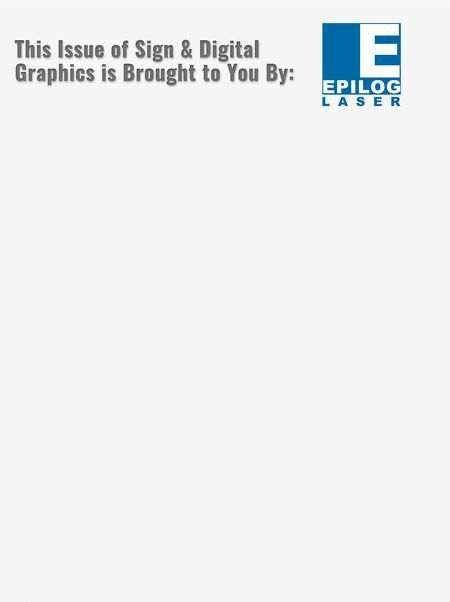 28 Chemical Etching: What is It and Why It Enhances Your Laser Engraving Business Find out why chemical etching can work with your existing equipment to offer even more opporutnities for your business. Liam Dullaghan, Masteretch, explains how. A National Business Media, Inc. publication PUBLISHER Dan Peckham dpeckham@nbm.com EDITOR Cassie Green cgreen@nbm.com LER ART DIRECTOR Kim M. Wright ACCOUNT EXECUTIVE Haleigh Erwin herwin@nbm.com ACCOUNT EXECUTIVE Shanna Rowley srowley@nbm.com SALES SUPPORT Ryan Applebaum rapplebaum@nbm.com CONTRIBUTING WRITERS FOR THE LASER ENGRAVING REPORT Amy Dallman, Liam Dullaghan, Eric Johnson, Chau Vo The cover image (top) for the Laser Engraving Report 2018 was supplied cour- tesy of Epilog Laser.